On a Cultural standpoint, the state is most famous for its annual Festival Internacional Cervantino, which is held in the city of Guanajuato along with some other associated venues around the state of Guanajuato. The Festival Internacional Cervantino sponsors a group of artistic and cultural activities with artists invited from other states and cities of Mexico along with renowned artists from around the world. 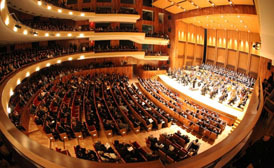 Visitors can see free shows of opera, theater productions, movies, art & craft exhibitions, academic conferences and discussions, musical concerts with local and national bands and even learn a few steps of local dance moves. The festival is held in no less than 70 different venues throughout the month of October. Tourists are often in awe during the festival when street artists, dancers, clowns and others, give small and impromptu displays on the streets, sidewalks and small plazas of the city which further increase excitement for attendees. The festival brings thousands of visitors to the city who stroll around the streets, seeing the many historic sights of the city along with the street entertainment. This festival is not to be missed and if you have the opportunity, you should make this a definite trip in the near future. Seldom can cultural history be mixed with such fun on just one trip, however be sure to book in advance because hotel occupancy rates spiral as high as 98% before, during and after the festival. Festival Internacional Cervantino is named in honor of Miguel de Cervantes, the world renowned author of Don Quixote. The first ever festival was held in 1972, as short plays performed by University of Guanajuato students based on the works of Cervantes. In 2013, special guests included the state of Puebla Mexico and the country of Uruguay and a special remembrance of Verdi and Wagner. Special presentations also include Arturo Chacón, Italian Barbara Frittoli and piano concertos from Cyprien Katsaris, Abdiel Vázquez and Édison Quintana. At the same time visitors can see the amazing Festival International Cervantino Callejero (street festival) which is funded by an organization called the Centro Libre de Experimentacion Teatral y Artistica (CLETA). This event unites over 320 performances with socially relevant themes. This tandem event began in 1975, initially inspired by the Beatles’ Abbey Road album cover. Then as a final addition to the celebrations, the Festival Internacional de Cine Expresión en Corto (short movie festival) began in 1997 and today has grown into one of the most important cinematographic events in Mexico. 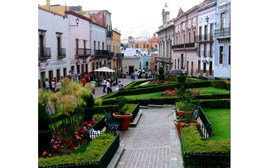 Visitors and tourists are well catered for because most events associated with the festival are situated in the city of Guanajuato and San Miguel Allende so everything is within walking distance, albeit sometimes quite a long time on your feet. As a final interesting twist to the festival, movies are often shown in unusual locations around the city, such as one of Guanajuato’s tunnels under the city or under the stars in the municipal cemetery at midnight. 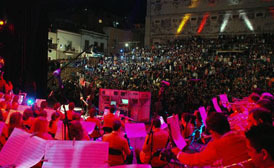 Overall the Festival Internacional Cervantino is a must see event and one you´ll remember for a lifetime.